The outlet was jam packed today. Banana Republic is having additional 30% off the entire store. I quickly discovered the tweed dress that got so much love from the petite community on the rack. I picked up a size 0 regular and it was marked down to $39.99 (plus 30% off). What an amazing deal! The smallest size available was a 0P. It was slightly big on me. The tag was $59.99. I thought for sure it was a mistake and didn’t think much about it. I was going to get the 0P anyway and get it altered since the price was too sweet to pass. At the checkout line, I sadly discover that wasn’t a mistake. $20.00 difference isn’t a huge deal but I don’t think I should pay extra for the same dress just because it is petites. In my opinion, petite pieces should cost less because of the shorter length/torso. Hence, less fabric used. BR is also running a promotion for suiting. Buy 2 (mix and match) for $75.00. The original price is $109.99. I am looking for a white blazer for the upcoming Spring and this one is just perfect. I love the fit and the fabric. I was shamelessly talking my girlfriend into getting one so we can split the cost. I am only interested in the white one since I already had the other color from the last season. She didn’t fall for me. Darn it! I wasn’t in the mood to spend $80.00 for 2 blazers. No white blazer for Sydney today :) I included the tag if anyone is interested. Like: The print is really pretty in person. It’s perfect for Spring and the price is right. Dislike: It is too short for work and too fancy for the weekend. I can’t see myself wearing this dress more than several times. Like: The print is really pretty. I don’t have anything like this in my closet. The fit is pretty awesome off the rack. The price is incredible! I also stopped by J.Crew and Ann Taylor but no luck. That is pretty much my whole Saturday. How’s your weekend going? Don’t forget to enter my giveaway for a chance to win a $55.00 gift certificate. You can also retweet daily for additional entries. A big thank to anyone who entered. Enjoy the rest of your weekend! Hopefully u can track down the tweed dress! Bummer about the white blazer! How did the tweed in 0 look on you? If you were going to get the 0P altered anyway, would the alterations cost for 0 be the same? I agree on buying the last dress. Never seen a print like that. Great buy! ooooh love the dress you went home with! The tweed dress looks really nice on you but I would be upset too about having to shell out an extra $20! You know what would look great with that last dress? The white blazer! Heehee, I'm jk very impressive that you practiced restraint when you were shopping. I'm bummed that BR isn't having that suit sale promotion online. Eck, the store that I go to doesn't keep small sizes in stock. @Cee I was thinking about the same thing on the way home. I didn't even try the 0R on. I guess I was just bummed about the price difference. I am not sure how big it was compared to the 0P. @curls-and-pearls Thanks Elaine! ReallyPetite is selling the same dress on the AN's forum. Check it out if you're interested. wow, i need to go to the BR outlet now! i'm so amazed at the deals you found. i actually really need a nice white blazer and am eying the one you tried on. and i'm really loving that last dress on you -- such a pretty print! 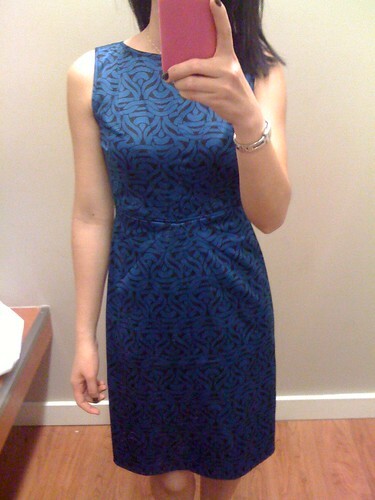 Loooove that blue printed sheath dress! They had something similar in the BR store a few seasons back that sold out instantly, much to my dismay. There is nothing that annoys me more than having to pay more for an item in petite...and unfortunatley, that is a way too common occurance! I really don't like how the petite size was so much more expensive... but like Cee, I thought that if you were planning to alter it anyway, it might've been okay to grab the cheaper size 0R? As for the blazer, if it were me and I loved it as much as you seem to, I'd buy two and return one later lol =X But good choice on the dress you did bring home, especially at the price you tweeted! Wow they really marked down that tweed dress! But I agree with you, a $20 price difference between petite and regular is absolutely ridiculous. I actually really like the floral print dress on you - too bad it's too short for work! BTW - the Nordstrom Rack is in the Rookwood Mall area of Cincinnati (I believe exit 6 off of highway 71). The last dress looks really great on you. eww that's annoying about the petite pricing! i hope you're able to pick it up for a better deal at some point. Love that last dress Sydney! !...so versatile. 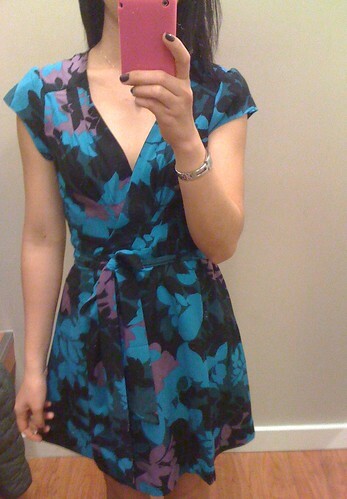 I tried on the floral print wrap dress too, but came to the same conclusion you did. @SewPetiteGal Thank you so much for the info. I definitely will check it out the next time I am in Cinci. Bummer about the BR tweed dress! And I love everything you tried on...and if I were on that trip with you I'd totally try to get you to buy the blazer too. :) Who can say no to a white blazer? That Blazer is amazing!! Too bad you didn't find anything at J Crew! I love that store! Have a great week! i love the last two dresses, gorgeous! what a great shopper you are :) you have a lovely blog, happy valentine's day! Lovely pick for that BR blue print dress! You've got an awesome great taste! p.s. I got the same one! 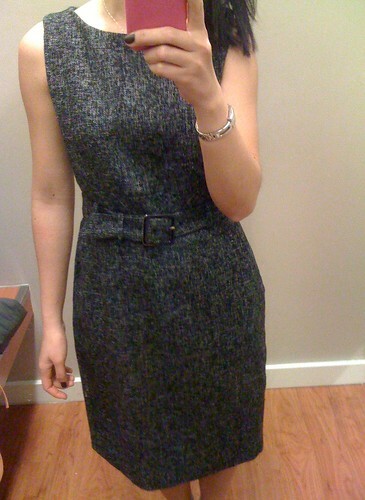 My gosh, Sydney, the tweed dress is a steal! I concur, the pattern of the last dress is very different, and definitely makes a statement. Love the cut of it - it's classy, but at the same time fun! Very versatile, as you can dress it up or down for many/multiple occasions.